After a 2-year production process, the start of summer 2010 saw Markus Schulz drop the curtain on his third artist album ‘Do You Dream?’ Equipped with 17 new productions, he took the critically acclaimed music on a world tour, personally introducing it to 100s of 1000s of clubbers around the globe. Through 18 countries, and over a 3-month period, the Dancefoundation team captured this journey. Our directive were simple: ‘shoot everything, miss nothing’… and that’s exactly what we did. The outcome of that lens odyssey is ‘Markus Schulz – Do You Dream? – The World Tour Documentary’ and it takes you, the viewer inside Markus’ professional life for the first time. Up close and at times personal, the camera captures his thoughts pre-gig in the ready-rooms, follows him through the anticipation of the backstage tunnels and up onto the stages of electronic dance music biggest, most celebrated events. Nature One, Sunrise, Dance Valley, Tomorrowland, Pleasure Island, Future Music – they’re all here, their crowd-generated electricity caught in HD. If you’ve been to one, you’ll want to see them all! From Amnesia nights, filmed from the pulpit to tornado-hit festivals in Russia and two-gigs-in-a-day dashes across Australia, you’re with him every step, jolt, rush and drumbeat of the way! Markus’ travelogue exploits on the DVD are naturally soundtracked by the incredible, extraordinary ‘Do You Dream’ album audio. You can see him roll out D.Y.D. floor-quakers, sometimes for the first time, and see the floor reaction. ‘Not The Same’, ‘Away’, ’65.4hz’, ‘Dark Heart Waiting’, Surreal’, ‘Alpha State’, ‘Unsaid’ are all on there and the DVD also includes the full official videos for ‘Dark Heart Waiting’, ‘Rain, ‘Future Cities’ and ‘Do You Dream’. 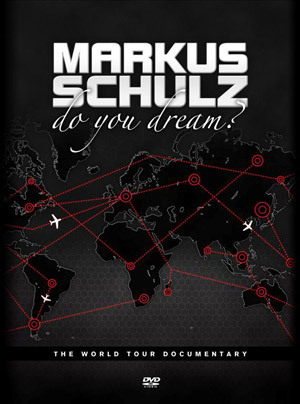 If you saw Markus Schulz play live anywhere in the latter part of 2010, this is the DVD you’re going to want to see and own. Get your copy at Armada Music. The documentary is available on Youtube as well.